Dental Products – In the “Dental Products” area of the “Customize Portals” section, you can choose to highlight popular products and dentistry services that you offer: Invisalign®, Zoom!®, CEREC®, Waterlase®, PerioProtect®, and more. 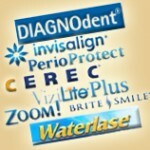 You can feature as many of these products as you wish on the “What We Offer” page of your dental website. You can also include up to 6 of them in your dental website page footers. Patients can click the logo of any product to learn more about it. These pages are pre-written and will automatically be included in your website according to your product selections. For legal reasons, the text of these pages cannot be edited.